This Cable Block is perfect for temporarily supporting any cable up to 2 3/4 in. (70mm) diameter on 1/4 - 3/8 in. (6-10mm) dia. suspension strand during new construction or while overlashing to existing lashed cable. 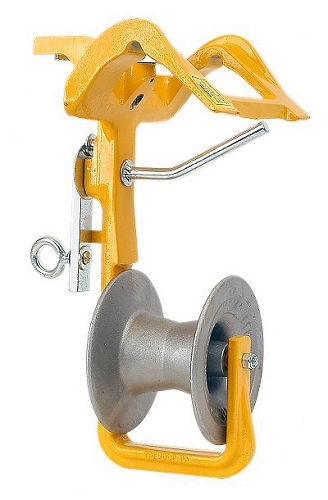 The frame and sheave are made from 100% heat treated aluminum alloy. Oilite bearings on the sheave and steel inserts on the underside of each strand hook provided for smoother operation and less wear and tear. Built-in lever controls both the keeper and spring-loaded cam during installation and removal. The cam holds the block firmly in position during pulling in, then releases during lashing so that the block can travel ahead of the lasher towards the end of the span. 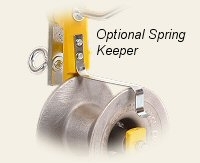 Optional spring loaded keeper is available to keep smaller cables captured in the pulley. The F Cable Block Lifter is designed specifically for placing F Cable Blocks onto suspension strand. Makes block placement from the ground fast and easy. Use with Extension Handles (Lay-Up Sticks). Lifter cradle supports the block while a hook operates block cam lever.